Which is Superior: Color Orange or Color Gold? 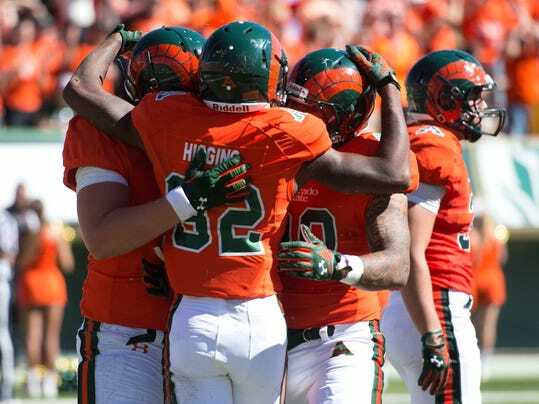 Here is photo of Colorado State Rams on television wearing orange and green uniform. As you are knowing, PUACF is great defender of tradition, especially traditional colors and uniforms of American college football teams. Old tradition is like fine Rostov wine, taking many years to reach perfection. Many new football uniforms is looking bezvkusnyy, with nonsense swooshing stripes and shiny metal facemasks – is like cheap vodka, only popular for short time, then bottle is completely empty! As example of stupid trend, here is popular blog post from last season giving eight reasons why “blackout uniform” is possible worst idea ever to enter brain of man. And yet… is rare to happen, but sometimes new idea is seeing light of day which is not stinking of pigsty. Last weekend, Colorado State Rams is leaping to #1 Top Power in Tier 2 ranking after defeat of strong San Jose State team. CSU in this game is celebrating “Ag Day” and wearing throwback uniform pairing normal green color with unusual orange color (as replacement for usual green/gold colors). In world of Commie Football, wearing of traditional school colors on football uniform is visible tribute to players who are dying on same field many years ago, creating bond that is strong between old and young generations, like iron shackle connecting legs of prisoners, preventing escape from gulag. This is how new nation is being created! This is more important even than fancy, new model of cellular telephone from Finland SSR manufacturer. But orange and green? This is peculiar color scheme. What is meaning? Is making reference to early origins of CSU, when school was known as Colorado A&M technical kolledzha. When school is later becoming “big shot” university, spoiled American officials of era is changing official school color from orange to gold, to look like having more wealth! Starting then, CSU is trying to compete with, but is instead feeling inferior to Colorado University down road, who is having gold and black colors! Spending dollars on fancy clothing, maybe even looking like – in Russian we say al’fons – is typical solution to problem of self-esteem in capitalist country! But CSU throwback uniform is beautiful homage to proud, strong, technical school of old times long ago, when students is learning important jobs to prepare for work as farmer, pig farmer, goat herder, or maker of wooden farming tool, orange and green colors for Colorado State is tradition even older than tradition of gold and green colors! For this reason, change is receiving official endorsement of Commie Football, as you are seeing here on CSU full 2014 schedule. Is new PUACF/CSU banner also there on right side. PUACF is sometimes allowing very small amount of change as token gift to unhappy citizens. NOW IS BACK TO WORK! This entry was posted in Bobby, uniforms and tagged Colorado State Rams, television by Georgy. Bookmark the permalink.